A daily deal start-up headed toward a summer launch aims to combine online discounts with consumer reviews of local merchants. LocFree Network LLC could start offering deals via LocFree.com in New York City in early summer, says Timothy Peterson, company co-founder and chief marketing officer. LocFree will not allow consumers to take advantage of future deals until those consumers review merchants who offered the previous deals, he adds. Merchants can contact consumers via e-mail to offer other deals, too. LocFree hopes to launch in New York City with at least 90 days worth of deals ready to go, he says. The deals will involve not only restaurants, but also museums, retailers—including, perhaps, local outlets of national chains—and entertainment providers. Offers might come to consumers via text messages, too. “We are looking at social,” Peterson says. 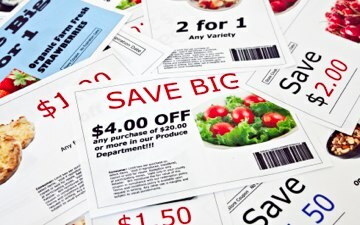 A report from eMarketer found that the popularity of mobile coupons is still rising, indicating that one in ten mobile users redeem coupons via their mobile device. Data from eMarketer estimates that nearly 20 million US adults will redeem a mobile coupon this year, including coupons or codes received via SMS, applications and mobile Web browsers; quick response codes for redemption online or offline; and group buying coupons purchased via mobile. 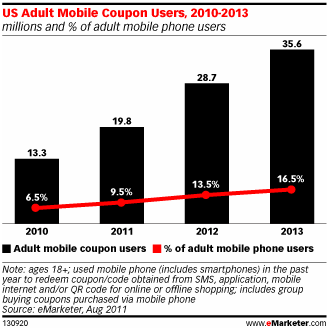 By 2013, the number using such coupons will nearly double, and 16.5% of all US adult mobile phone users will redeem a coupon that year. Not surprising, mobile coupon usage is much higher among smartphone users, where nearly one in five users ages 18 and older will redeem a mobile coupon, representing growth of 117.6%. Triple-digit uptake rates will be short-lived, according to the research, but by 2013 almost one-third of smartphone users will be redeeming discounts on the go. Results from a survey conducted by Placecast Inc., a vendor of text-based marketing services, reveals that up to 34% of consumers who receive text ads redeem them. Up to 35% of consumers who have opted in to receive targeted promotional text messages from a retailer or brand subsequently visit that store or e-retail site, according to research conducted by Placecast Inc., a vendor of text-based marketing services. And among consumers who visit a store or web site, up to 34% report redeeming the coupon or promotion offered in the text. Placecast surveyed a panel of consumers to understand their actions and also analyzed its clients’ redemption data and analytics to come up with its findings. Placecast CEO Alistair Goodman says redemption rates can vary, from 11% on the low end to more than 65% depending on how appealing the offer is. “We’ve seen some outliers, as high as 65%, when a retailer delivers a great promotion for an impulse item,” he says. Placecast clients include outdoor gear retailer The North Face and apparel retailer White House Black Market. The North Face is a unit of VF Corp., No. 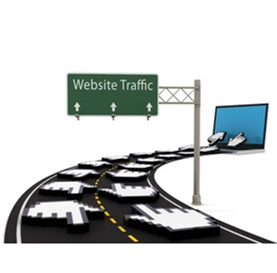 138 in the Internet Retailer Top 500 Guide. White House Black Market is a unit of Chicos FAS Inc., which is No. 129. AT&T also entered a partnership with Placecast earlier this year to provide consumers a way to deliver messages from retailers or brands to AT&T customers when they are near store locations or stores that sell the brand’s products. A consumer within a certain geographic range of a Kmart store, for example, may receive a coupon or other offer to redeem with the retailer. Or the consumer might receive an alert from home cleaning products manufacturer S.C. Johnson about a special on its Pledge furniture cleaner at the nearby Kmart. Up to 90% of consumers surveyed indicate they find the text message alerts useful.